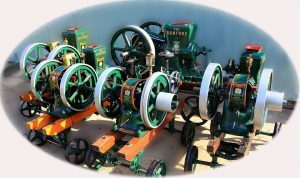 THIS WEBSITE IS RUN BY DENNIS & PHILLIP NAMELY THE BAMFORDS ENGINE & MACHINERY GROUP. HENRY BAMFORD & SONS ARE ALL DECEASED AND THE COMPANY CLOSED IN 1987. WE HELP AND ADVISE ENTHUSIASTS OF BAMFORD ENGINES AND WE HAVE ONLY LIMITED PART FOR COLLECTORS IN UK ONLY . Welcome to the home page for the Bamford web site. The site is operated by the Bamford Engine and Machinery Group, a non-profit group of enthusiasts dedicated to renovating farming equipment from a time gone by. The equipment was all manufactured by H. Bamford and Sons who were based at Uttoxeter in Staffordshire and went on to achieve world- wide recognition for their equipment. In these pages, we hope to give you an illustration of the rise of one of the UK’s foremost agricultural and farm implement manufacturers. Also included in the site are illustrations of the family tree, the board of the company in 1921 and many pictures of the products and the works of Henry Bamford & Sons. Some of the pictures will change as you roll the mouse over them so you will be able to see two images in the same place. If you have any comments, equipment for sale or even anecdotes relating to the company that you wish to share, please use the forum. If you have pictures of equipment that you want to show others, please click on the link below.